Emoji 11.0 today reached its final form and includes emojis for redheads, curly hair, superheroes, softball, infinity, kangaroo and more. Users can expect to see these new emojis on their phones in the second half of 2018. To celebrate this announcement, Emojipedia is today releasing sample images for the entire new emoji list. Created in an Apple-like style, our sample images aim to capture how these emojis might look when arriving later in the year. Announced today by the Unicode Consortium, Emoji 11.0 marks the first time new components are available for hair color. Options are provided for red hair, curly hair, white hair, and baldness and these are available for use in sequences for men and women of any skin tone. Other notable inclusions include emojis for popular activities such as sewing, knitting, lacrosse, and skateboarding. 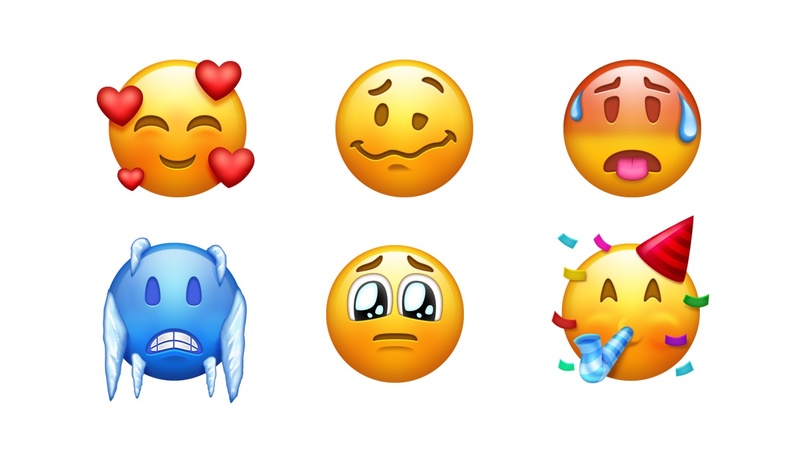 Above: Emojipedia Sample Images for Emoji 11.0. Original designs created by Emojipedia to display how these emojis might look when released. Image: Emojipedia. Please feel free to use our original images when discussing this emoji update, with attribution to Emojipedia. We hope you like this visual look at what we might be messaging with later in the year! Update June 2018: Unicode 11.0 which contains many of the new code points required in Emoji 11.0 is due for publication on June 5, 2018. This marks the date that vendors may begin including these new emojis in software updates. All 157 new emojis for 2018 are listed below. 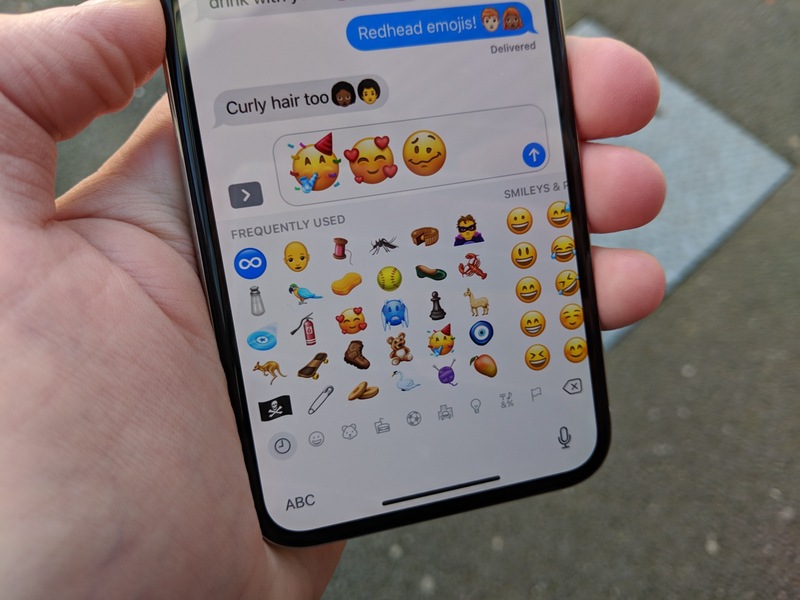 Note that the actual emojis will not yet display inline in this article until operating systems are updated to support these later in the year. Of the new emojis listed in Emoji 11.0, the infinity symbol is already a Unicode character and displays as an emoji on Samsung devices. Other devices may already display a black and white glyph for this character. The Pirate Flag emoji is a ZWJ Sequence that is already supported by Twitter's open source emoji project Twemoji, and will display as a 🏴 Black Flag and ☠️ Skull and Crossbones on unsupported platforms. 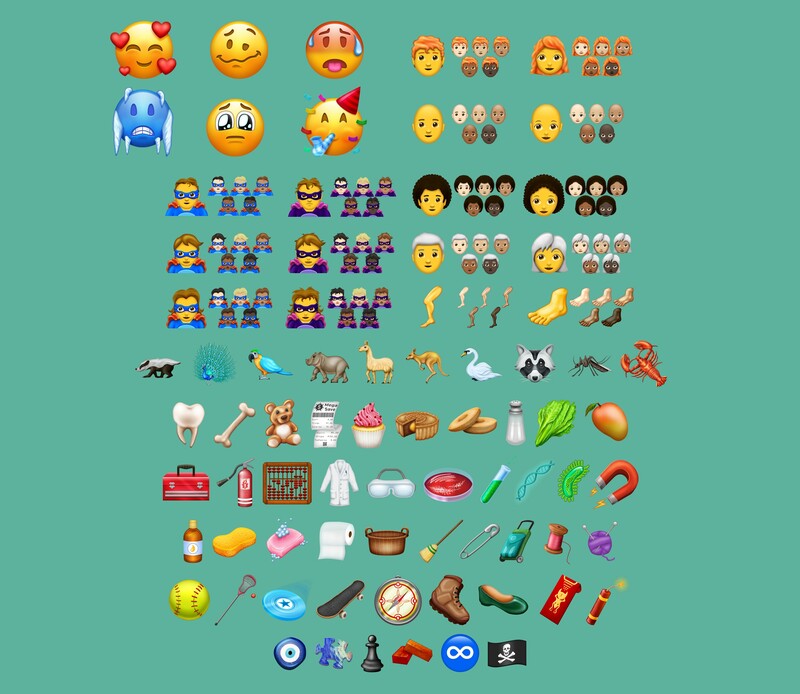 Above: A mockup of Emojipedia Sample Images shown on iPhone X. Photo: Jeremy Burge. Versioned as Emoji 11.0, this emoji release is the version that follows Emoji 5.0. The reason for the jump in version number is to align emoji releases with full releases of the Unicode Standard from 2019. A recently published timeline document shows Emoji 12.0 and Unicode 12.0 both aligning for release in March 2019. Above: Smileys are generally the most popular additions in any emoji release. Image: Emojipedia. While today marks when the emoji list for 2018 is final, the specication for Emoji 11.0 is still a draft. Reversible emojis are still listed in the latest version of the specification, although no sequences for which emojis should change direction have been specified. As such, this feature would likely not be seen on devices until (potentially) 2019.